Minister for Agriculture, Rural and Mari­time Development, Waterways and Environ­ment, Mahendra Reddy made the comments in his opening remarks at the Roundtable Meeting of Agriculture Ministers for China and the Pacific Islands at the Sofitel Fiji Re­sort and Spa in Nadi yesterday. The “Nadi Declaration of China and Pacific Island States on Agricultural Cooperation” should focus on produc­tion and trade creation. This is rather than focus on trade diversion between China and the Pacific. 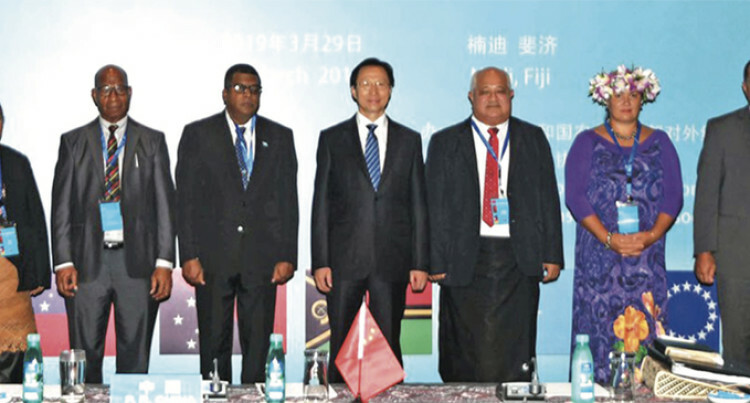 Present were China’s Minister for Ag­riculture Han Changfu and Agriculture Ministers from Pacific Island States in­cluding Papua New Guinea, Vanuatu, Tonga, Samoa, Cook Islands, Niue, the Federated States of Micronesia and Fiji. He said Pacific Island Countries were con­fronted by many challenges that hamper economic growth including risks from cli­mate change, insufficient financial resourc­es, and the difficulty of prioritising adapta­tion measures. In Fiji in 2017, Mr Reddy told the meeting that agriculture crops and livestock sector contributed FJ$557.3 million to total Gross Domestic Product (GDP) or eight percent to national GDP. In 2017 Fiji earned FJ$208 million from the export of domestic non-sugar crops and live­stock, yet Fiji consistently ran an agricul­ture trade deficit. Mr Reddy said the 2017 World Bank Vulner­ability Assessment for Fiji estimated that cyclones and floods had cost at least FJ$791 million in damages and losses to the agricul­ture sector over the last 16 years. “In order to deepen cooperation between PICs and China, we need to explore path­ways and establish good practices for devel­oping a sustainable agriculture sector in the Pacific region that takes into account these challenges. Mr Reddy said the PICs looked to China to provide support in efforts to boost produc­tion and supply and opening of China’s mar­ket to assist suppliers reach their market. “Here in Fiji have now decided let market demand derive production. “Before that, we need to develop the infra­structure; support industries so that we can modernise agriculture and get the supply side ready to respond to demand signals. “The commitment and interest shown by your great country towards the well-being of the Small Island Nations of the Pacific is very highly valued,” Mr Reddy told the Chi­nese delegation.